Want to own a piece of modern mountain bike history? Here's your chance to win the 21st centuries first 650B mountain bike, spec'd out with one-of-a-kind components custom-made for this bike, which was first debuted at the North American Handbuilt Bicycle Show in in March 2007. Kirk Pacenti, a frame and component designer best known for www.bikelugs.com, realized that the almost century-old 650B wheel was the ideal size for contemporary mountain bike designs, and it seems many other designers agree with him. In fact the 2007 Interbike show in Las Vegas included no less than ten 650B mountain bikes on display, including nearly 20 booths displaying some 650B-specific content or products. Several of these companies already have 650B mountain bikes planned for 2008 season. The bike shown here is the first ever Pacenti 650B mountain bike, and Kirk's personal rig. 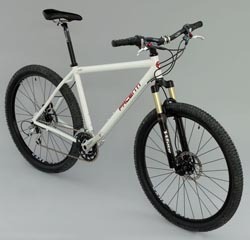 Its built up with several one-of- a-kind components and concepts that represent a pivotal moment in mountain bike history. This bike was also recently tested in Dirt Rag Magazine issue #131. The winner of the raffle will also receive an autographed copy of the magazine to go along with the bike. Be one the first to experience the revolutionary ride characteristics of 650B in the dirt aboard this very unique machine. Go to the Pacenti Cycle raffle here. Fork: Custom built, 650B specific, White Brothers Magic 100. Wheels: Custom made Cane Creek, Zonos Team Disk wheels. This set is 1 of only 5 existing sets; no more will be manufactured. Tires: Pre-production Pacenti 650B (27.5") tires labeled as "Baby Bear", very rare, as the tire name was changed for production to Pacenti Neo-Moto. Components: a mix of Kirk's personal favorites including, Cane Creek Solos head set, XT drive train and derailleurs, Avid Juicy 7 brakes, Grip Shift Rocket shifters, Ritchey stem, bars, post and Fizik Nisene saddle. RAFFLE CONDITIONS: The raffle will run through March 10th, 2008. There will be a minimum requirement of 400 tickets sold for the raffle to be valid. If fewer than 400 tickets are sold the raffle will be extended until the minimum is reached. The price of the raffle ticket will not include the Bikereg.com service fee of $4.60. If the minimum of 400 tickets are not sold after a reasonable extension period, the raffle may be ended and winner drawn or participants may receive full refund, less the Bikereg.com service fee of $4.60. This decision will be made at the discretion of Pacenti Cycle Design. NOTE: All proceeds from the raffle will be used to produce more 650B tire designs. So, if you think 650B wheels are a good idea show your support by buying a ticket! This bike is used but in excellent condition. The bike will be professionally tuned, packaged, insured and shipped world wide at no cost to the raffle winner.